Close your eyes and imagine yourself on an island far away, a light breeze touches your cheek as you enjoy lunch under the leaning palms. You’d never know that just feet away is a crashing wave pool and gushing water slides. Welcome to Typhoon Lagoon and the Leaning Palms counter service restaurant. 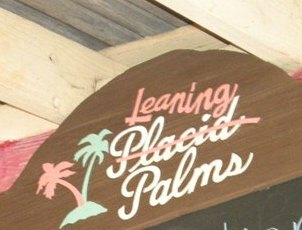 Leaning Palms is the headlining counter service restaurant at Typhoon Lagoon The seating area is large and primarily open-air, but a large portion of the area is protected by a pergola-style roof. Besides standard counter service fare, Leaning Palms provides some refreshing alternatives, such as a summer salad with grilled chicken, as well as unique specials listed on a daily board. Children’s options include a grilled cheese pretzel, hot dog, or peanut butter & jelly sandwich. Few vegetarian selections are available. Classic counter service fare such as pizza, cheeseburgers, chicken nuggets, and hot dogs are featured. Healthier options like a summer salad with fresh greens and grilled chicken or a chicken wrap are also available. Dessert items include cheesecake or chocolate cake. Snacks items include a fruit cup, assorted chips, and french fries. A variety of soft drinks, fruit juices, water, domestic beer, and hot beverages are on the menu. Children have the choice of a grilled cheese pretzel, hot dog, or peanut butter & jelly. Make sure to check out the daily special board hanging above the registers.